But in fact we called for no such thing. Read the piece. Nowhere in it did we call for US intervention. What we called for is a United Nations Security Council resolution authorizing the use of force for the specific and very limited purpose of getting food and medicine to starving Syrian civilians trapped in the country’s besieged areas. Dreyfuss raises no objections at all to Moscow’s pattern of obstructionism on the humanitarian front. If Assad insists on maintaining the kneel or starve sieges that threaten to kill hundreds of thousands of Syrian civilians—which the UN High Commissioner for Human Rights (OHCHR) has called a war crime—Russia has his back, and Dreyfuss is all right with that. Because Moscow has blocked multiple humanitarian measures on Syria, Hashemi and I proposed that an ensemble of countries invoke the Responsibility to Protect principle in the (likely) event of yet another Russian veto. Nowhere in the piece did we call for the United States to intervene. We call for a multinational force. We mentioned signs of French interest in this course of action. The only other countries that seemed to be thinking along these lines were Australia, Jordan and Luxembourg. Yet Dreyfuss implies that we argued for the United States to “barge” into Syria. This isn’t just sloppy—though it certainly is that. It reflects a myopic, US-centric tunnel vision in which everything comes back to the United States. This monochrome “anti-imperialism” is in fact an inverted form of imperialism. It’s striking how worked up Dreyfuss gets about the American role in the Syrian conflict, given that the United States has done next to nothing about Syria over the three years since the uprising began. Dreyfuss actually takes John Kerry to task for “demonizing Assad.” Seriously? Demonizing Assad? Three years of reports from Human Rights Watch, Amnesty International and the UN’s Independent International Commission of Inquiry on Syria provide a detailed record of Assad’s war crimes, mass atrocities and crimes against humanity—yet Dreyfuss complains that the mass murderer is being “demonized”? Russia boosted military aid to Syrian President Bashar al-Assad in the weeks leading up to Geneva and Assad bombarded civilians with explosive barrels and banned cluster munitions even as his deputies sat at the negotiating table. In recent weeks, these and other assaults have killed scores and forced as many as 500,000 to flee their homes. At the same time, the regime’s starvation and siege of entire communities, systematic torture of political prisoners, and other crimes against humanity continue unabated. But from Dreyfuss’ perspective, Russia’s stance on Syria is perfectly reasonable. This affinity for Russia’s geostrategic point of view is a consistent theme in Dreyfuss’ blogging, not only on Syria but in general. It is a cold-blooded logic that serves to soft-peddle Moscow’s complicity with Assad’s killing machine. There is nothing progressive whatsoever about defending Russia’s role in Syria, no matter how one packages it. It’s whitewashing, pure and simple. And it’s disgusting. The Geneva talks…represent the only hope of stabilizing the crisis in Syria, and if it’s possible to arrange even local ceasefires for the delivery of humanitarian supplies, then lives will be saved. 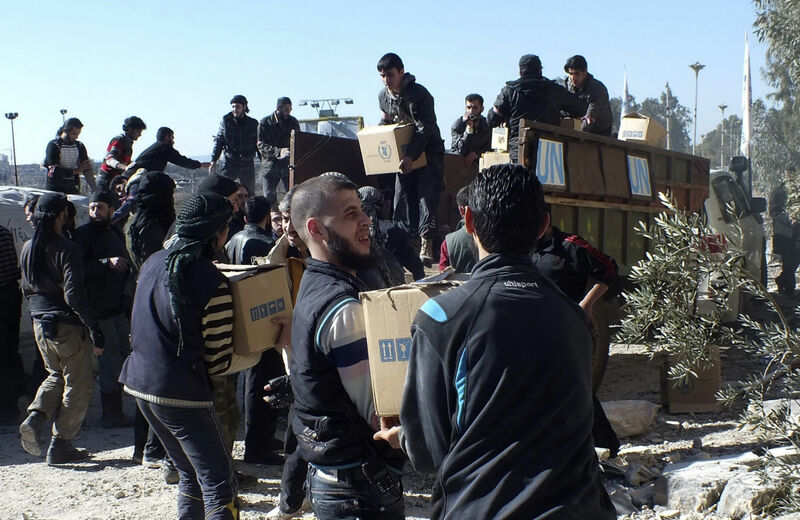 The recent attacks on the convoys attempting to deliver humanitarian aid into the besieged city of Homs are a case in point: The lifting of the sieges can’t be left to the warring factions on the ground. An external, international force must be introduced to guarantee the safe passage of food and medicine to starving Syrian civilians. Dreyfuss views this as a “really terrible idea”—fine. Then what’s his idea? To call for more talks and negotiations between the warring factions without addressing the fact that this process has utterly failed not only to produce a resolution to the conflict but even to bring relief on the humanitarian front—even just in one small area of Syria at that—is an exercise in evasion. Should hundreds of thousands of Syrian civilians be consigned to starvation because the warring factions can’t agree to end the sieges, or decide to violate the meager agreements that have been reached? Is that an equation Dreyfuss is okay with? We are not okay with that equation. We argue that there are higher principles at stake. We do not believe that Assad has the sovereign right to starve civilians to death. Does Dreyfuss? If not, then what should be done—other than the same things that have failed to work thus far? Dreyfuss might view the new Security Council resolution on humanitarian access as a breakthrough, and as vindication for his insistence on diplomacy over force. I enthusiastically applaud the resolution, not least because it demands an end to Assad’s barrel bombs and condemns the starvation sieges. Security Council resolution key step for humanitarian aid for #Syria but people can’t eat words. Enforcement needed. asks U.N. Secretary-General Ban Ki-moon to report to the council in 30 days on implementation and “expresses its intent to take further steps in the case of non-compliance.” Diplomats say Russia is unlikely to agree to any action if Syria’s government was found to be in non-compliance. Question for Bob Dreyfuss: What then? What if regime forces once again shoot up a humanitarian convoy or otherwise block the delivery of aid, and Russia stands by its ally, blocking any “further steps”? What then would Dreyfuss suggest? Will he continue to defend Moscow’s stance and oppose any other measures? Will he remain supportive of Russia having the final say over whether starving civilians eat?